The crowd capacity for Sutton United’s FA Cup third round tie with Coventry City has been fixed at 8,000. Last year a 6,000 limit was imposed on Sutton’s game with Middlesbrough, but the club have been allowed an extra 2,000 people for the Coventry game if they comply with certain adjustments to Gander Green Lane. The club have agreed and work got under way this week with the prime improvement concerning the fence around the pitch. “It will give a more intimate nature to the pitch while increasing the flow of people behind the goal. The work is likely to cost £1,500, but Sutton must also come up with an alternative tannoy system so that if there is a power failure on the day, messages can still be relayed. The club has also improved car park lighting. Sutton United manager Barrie Williams is confident his side can pull off another FA Cup third round surprise against Coventry City on Saturday. He says: “After our exploits against Middlesbrough last season anything can happen and we basically have nothing to lose. Coventry, on the other hand, will not like coming to Gander Green Lane and that is a distinct advantage”. But Williams would be the first to admit that his side’s Conference form of late has been poor but he adds: “Obviously however much I try to take the players’ minds off the match with Coventry in their subconscious the thought will still be there. “I admit we didn’t play well at Maidstone on Boxing Day but the pitch was in a terrible state and at Aylesbury on Saturday the home side were always going to want to beat us after we knocked them out of the FA Cup. “We perked up a bit on Monday in the return game with Maidstone and the signs are looking good”. Stuart Hemsley and Tony Rains were missing on Monday, both were out injured, but the pair are confident they will be fit for Saturday. Tony Rains said after the Maidstone game: “I hurt my knee at Aylesbury and basically it was a precautionary measure not to play today. But I wasn’t rested, I would never do that, the Conference is important to Sutton”. So how are Us going to approach their biggest game at Gander Green Lane since they met Leeds United in the Fourth Round of the FA Cup in 1970? “Well”, says boss Williams, “we will approach it as we do with any other game." “There is no way we will go out there and play for a draw." Coventry City could not be better prepared for their visit to Gander Green Lane having thrashed Sheffield Wednesday 5-0 at Highfield Road on Monday. And a Coventry source says “It really should have been eight or nine goals and I can see them repeating that scoreline against Sutton. Three of the goals came from the head of David Speedie, his second hat-trick of the season. But he will remember this one with more pride because the last one still saw his side on the wrong end of a 4-3 scoreline against Middlesbrough. Speedie refused to take home the match ball that day but no doubt had no such qualms this time around. The other goals came from Steve Sedgley and a Brian Kilcline penalty and it was a good start to the New Year for both of them. It was also a good day for Trevor Peake, who returned after suspension, and Lloyd McGrath and Dave Bennett both returned to the side having recovered from broken legs. McGrath is a solid ball winner and tackler, so is a key member of the squad, which has changed slightly. Greg Downs, who has asked for a transfer, has been dropped and David Phillips drafted into the left back position. Sedgley and McGrath play in the middle and David Speedie, who had been playing in midfield and scoring well, has been moved up front once more. The game on Monday also saw the return of Cyrille Regis who had missed two games through a flu epidemic that swept through the team. Indeed, manager Sillett drove to the game at Everton on Saturday in his own car because he had flu and didn’t want to further infect the team. And our Coventry source says: “The team is likely to be the same as Monday, after all who would change a winning side like that. Gary Bannister won’t be considered because his suspension for his Boxing Day sending off at Southampton starts on Monday and John Sillett has said it would be silly to consider him. Sutton United will run out in front of the cameras on Saturday kitted out in a new strip. Us have ordered a new kit from New Olympic and christened the new attire at Aylesbury on Saturday. Saturday is the big day for Sutton United as their long-awaited FA Cup clash against First Division Coventry City at Gander Green Lane. Apart from the all-ticket capacity crowd, United will also be seen by millions of BBC-TV’s ‘Match of the Day’ viewers later in the day. For the second year running, the giant-killers’ spotlight will be very firmly on Barrie Williams’s men. They will be hoping to go one better than last year when they held Middlesbrough – now of the First Division – to a 1-1 draw before narrowly going down to an extra-time goal at the replay at Ayresome Park. After a slightly inconsistent start to this season, Sutton’s form began to pick up after they qualified for the FA Cup proper with a comfortable victory over Walton and Hersham. United are confident that they can go one better then last year and cause a real upset against Coventry – upset winners in 1987. However, City boss John Sillett will not be underestimating the task ahead of his side. “My brother, who’s at Hastings, knows a lot about the non-league scene and he’s warned that Sutton are a useful outfit,” he said. 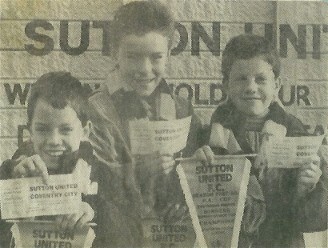 Coventry fans searched for their road-maps when Sutton’s name out of the hat but not Sillett. “Funnily enough I used to live down the road at Carshalton so I’m well aware of what’s awaiting us at Gander Green Lane,” he said. Coventry, currently enjoying their best-ever season in Division One, will be full of confidence following their 5-0 victory over Sheffield Wednesday last Monday and Sutton will have to pay particular attention to internationals Cyrille Regis and David Speedie. Sutton’s hopes will rest on the free-scoring Lenny Dennis and his strike partner Paul McKinnon. Sutton’s most successful cup year was back in 1970 when after overcoming Hillingdon Borough in a marathon battle, they went on to face the might of Don Revie’s Leeds side in the fourth round at Gander Green Lane. Despite plunging to a 6-0 defeat, it was a never-to-be-forgotten day with 14,000 cramming in to watch the then League champions in action. Leeds were more than impressed with their opponents and Revie returned a few weeks later to sign Sutton centre-half John Faulkner. But no one will start dreaming of the fourth round again before 4.45pm on Saturday although the draw can be seen on BBC Breakfast Time on Monday. Incidentally, don’t bother to turn up if you don’t have a ticket – the game was sold out last week.